As you guys will know (from me going on about it on Twitter, Instagram and this blog!) 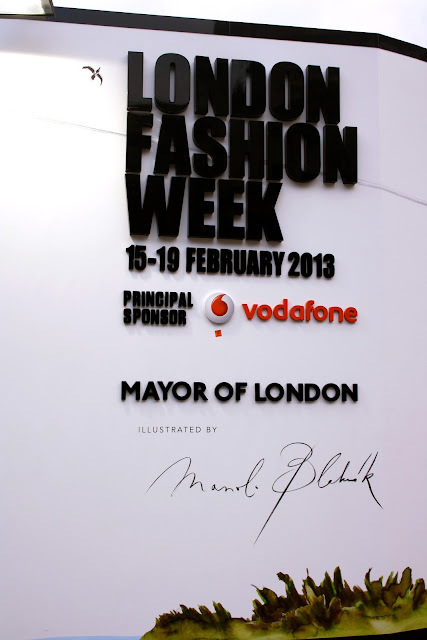 on Friday I went to London Fashion Week! I was asked to go with Motel as part of their street team, which meant snapping my favourite looks and handing out discount vouchers to everyone! 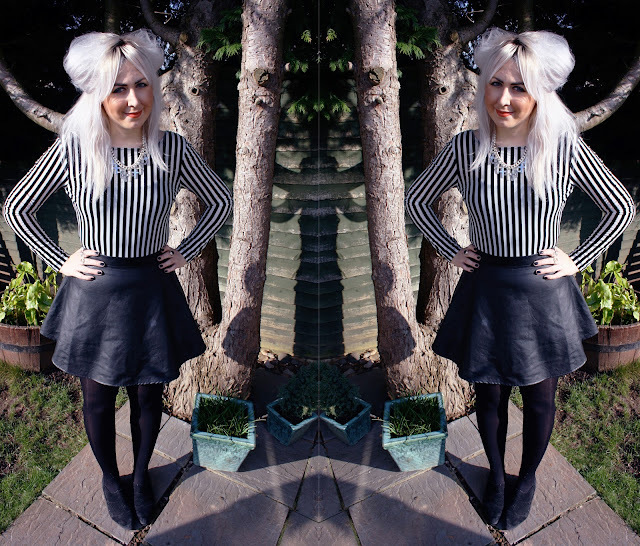 I decided to wear the Motel Agnes Dress, which combines all of my favourite 2013 trends in one; monochrome, bold stripes and luxe leather. Ever since I saw it on the sample rail at Motel Rocks HQ back in October I fell in love and was so happy when it was finally released! I teamed it with some suede black flats, a Rock N Rose statement cross necklace and some bright colour pop lipstick, and snapped this quick picture before setting off for the coach station. I caught the 10.30am coach which got me into Victoria at 1.15pm and was greeted by Taz as some of you will know as a Motel Intern from last year. Taz is now a LCF student and definitely one of my favourite people i've met through Motel if not ever! 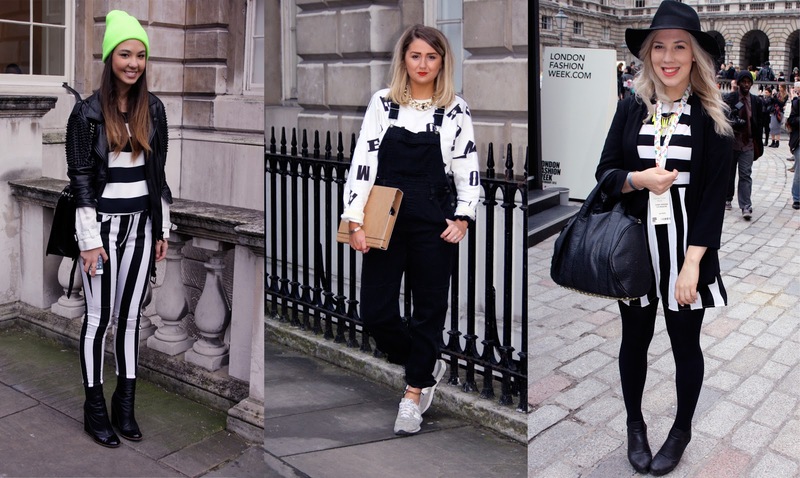 We headed straight to Somerset House and met up with Selina, Lucia and the rest of the team and started snapping. I was approached by Company Magazine, ASOS and several bloggers to have my picture taken which is so flattering and ended up spending most of my time chatting away! I met Lucy from ASOS Fashion Finder who was so lovely and was really happy to spot Robyn, who always leave such nice comments on my blog; it was great to meet her in person finally! I'm not sure if this is a bit controversial but there are some pretty odd sights at LFW; including a man with tape over his eyes and a walking stick pretending to be blind, which to be honest just freaked me out a bit. I understand pushing the limits for fashion but some people really do take it too far, I much prefer more understated fashion and people who just have natural style rather than gluing things to their face and being alternative for the sake of being photographed. We left Somerset House at 4ish and headed back to Tazs flat in East London, which was a welcome relief for how cold we were! After warming up with a cup of tea we headed out to Spitalfields Market for some Greek food and a few drinks. Several drinks later we ended up in Big Chill on Brick Lane and I just had a great time catching up and meeting her new Uni friends. I have to say if you don't know London too well and are planning on heading there for the day or a night out, Brick Lane area has to be one of my favourites! Spitalfields Market has a huge range of restaurants and the general area is full of vintage shops and bars. Jimmy and his Girl A vintage fashion blog. Your outfit is gorgeous!! Love your blog, I'm a new follower! Really can't wait to read more! :D in love with your blog! I'm following you now, too <3 your style is amazing! Yoy look gorgeous in that motel dress! might have to but it now I've seen how lovely it looks on! Love your outfit! looks great !! i love your hair! such quirky style. also you have a great job, being a manager of a motel store must be amazing! My Blogger Of The Month: Amy Bell!